Last night in London kilts and headdresses collided as two very distinct worlds united. It’s hard to imagine there has ever been a more amusingly incongruous marriage than Scotland and Brazil. Certainly the marketing minds behind Ballantine’s Brasil have been having fun with the idea. The launch's accompanying cocktail creations include the Highland Samba and the Glen Coco. Lest we forget, there are fewer than 100 days until Pele has to choose his tie and World Cup Brazil kicks its first ball. The engines of Brand Brazil are already roaring and the carnival will motor right through to the Rio Olympics in 2016. Alcoholic drinks brands are too savvy to say it (Fifa is not unfamiliar with litigation) but Brazil is a big marketing opportunity, official sponsor or not. For the record, Budweiser is the only booze brand to sign up as a partner. The good people of Ballantine’s have read the legal brief and have made no mention of this summer’s football, nor Rio 2016. According to Chivas Brothers’ Peter Moore, a Brazilian themed Ballantine’s has been in the planning for at least 18 months. Ballantine’s has been selling in Brazil for 100 years and is the brand’s top South American destination. What’s more Brazilians are partial to mixing Scotch with lime – hence the lime-Scotch combination in Ballantine’s Brasil. “It’s fortuitous that the World Cup is happening but Ballantine’s Brasil is not about football,” Moore told DI. So, we are to believe that this line extension is just the timely execution of a preordained plan. But will Ballantine’s Brasil depart in an equally timely fashion – 2017 perhaps? “Our plan is that this product will have a long life,” replies Moore with a straight bat. Of course Ballantine’s is not alone. 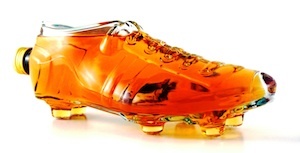 Also on the roster is Pernod’s very own Absolut Brazil, I Heart Brasil Sparkling Moscato, Funkin Brazilian cocktail mix and DI’s personal favourite Golden Shoe from Schwartze & Schlichte (pictured). There are more out there and no doubt more to come. We have already seen Dewar’s Honey – not to mention the rumoured J&B Honey - so the good ship Flavoured Scotch (or spirit drink, to be precise) has well and truly sailed. So why not set the compass for Brazil and really make a killing? In the flesh Ballantine’s Brasil isn’t the extravert concoction you might think. The lime is more a wink of an eye to Brazil than a citrus-kick in the face. Sugar too has been rationed – this is no saccharine-seduction. The spirit drink is designed to be mixed though and the signature cocktails, which will be promoted in global markets (mainly Europe), should work well with a younger audience – even if the purists may prefer a Caipirinha. With Pernod’s Chivas Regal and Royal Salute offering blended glitz, there’s room down market for a more playful scotch brand and it appears that brand is to be Ballantine’s. And perhaps it’s simplistic to say Ballantine’s Brasil is all about opportunism. Brazil is a positive, vibrant place that brands want to be associated with – sporting tournaments or not. If it was all about the World Cup then we could expect to see Ballantine’s Russia in 2018 or even Ballantine’s Qatar for 2022, both of which seem a trifle unlikely.